Load balancing is one of the typical features of messaging systems. Although some don't do it (MQTT), most of them provide some way to spread a workload among cluster of boxes. 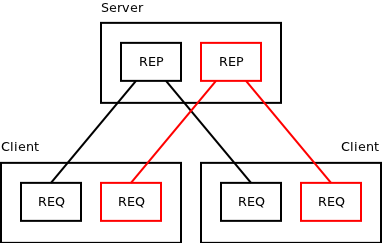 In ZeroMQ load balancing is done via REQ (requests that require replies) or, alternatively, by PUSH socket (requests that don't require replies). When designing it, I've opted for completely fair load-balancer. 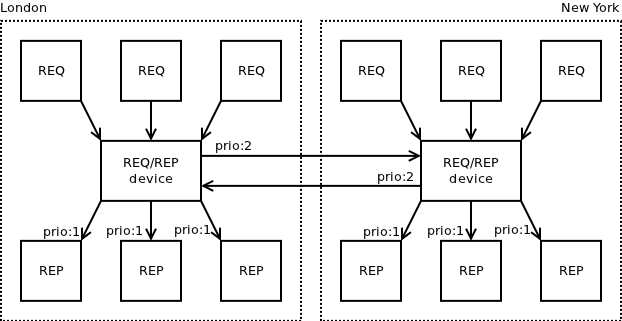 What it means is that if there are two peers able to process requests, first request goes to the first one, second request goes to the second one, third request goes ot the first one again etc. It's called round-robin load balancing. Of course, if a peer is dead, or it is busy at the moment, it's removed from the set of eligible destinations and left alone to re-start or finish the task it is dealing with. For nanomsg I've chosen a more nuanced approach. 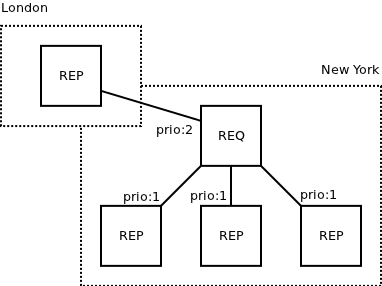 Similar to ZeroMQ, load balancing is done by REQ and PUSH sockets, however the algorithm is different. Instead of having a single ring of peers eligible for processing messages, nanomsg has 16 such rings with different priorities. 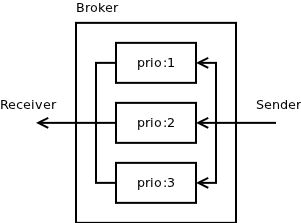 If there are any peers with priority 1, messages are round-robined among them. The peers with priorities from 2 to 16 get no messages. Only after all the priority 1 peers are dead, disconnected or busy load balancer considers peers with priority 2. Once again, requests are round-robined among all such peers. If there are no more peers with priority 2, priority 3 peers are checked etc. Of course, once a peer with priority 1 comes back online, any subsequent messages will be sent to it instead of to the lower priority peers. Now, the obvious question is: How is this useful? What can I do with it? As you can see, local services have priority 1 and they are thus used, unless all of them are dead, busy or disconnected. Only at that point the requests will begin to be router across the ocean. There's a similar priority system implemented for incoming messages (NN_RCVPRIO option). It's somehow less useful than the load-balancing priorities, however, it may prove useful in some situations. What it allows you to do is to process requests from one source in preference to requests from another source. Of course, this mechanism kicks in only if there is a clash between the two. In slow and low-collision systems the inbound priorities have little effect. As long as there are requests from the client (REQ) on the left, the server (REP) will process them and won't care about requests from the client on the right. EDIT: The RCVPRIO option was removed from nanomsg for now, as there were no obvious use cases for it. If you feel like needing it, please discuss your use case on nanomsg mailing list. Finally, it's interesting to compare the above system with how priorities are dealt with in traditional messaging systems. Old-school messaging systems typically attach the priority to the message. The idea is that messages with high priorities should be delivered and processed faster than messages with low priorities. While the above may seem to be just a matter of different design philosophy, there are sane reasons why nanomsg handles the priorities in the way it does. This model works OK for traditional, slow messaging systems. The messages spend most of their lifetime stored in prioritised queues on the broker so there's no problem. However, in modern, fast, low-latency and real-time systems it is no longer the case. The time spent inside of broker approaches zero and most of the message lifetime is spent inside TCP buffers. Topology for "urgent" messages is drawn in red. Topology for "normal" messages is in black. Client sends request to either "urgent" or "normal" REQ socket, depending on the priority level it is interested in. Server polls on both REP sockets and processes messages from the "urgent" one first. 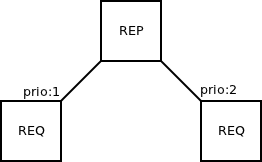 Finally, given that the two topologies use two different TCP ports, it is possible to configure network switches and routers is such a way that they treat urgent messages in preference and that they allocate certain amount of bandwidth for them, so that network congestion caused by normal messages won't effect delivery of urgent messages.